Did you know that the more sugar you eat, the more at-risk you are for cavities? Sugar itself doesn’t necessarily cause a an immediate cavity, but you do get tooth decay because of the effects of sugar on your teeth. That is why it’s so important to brush and floss your teeth every day and to keep your mouth clean. You may be watching your sugar intake, not realizing that you are still going over recommended sugar guidelines. Even diet or “healthy” foods are full of sugar in many cases, which means you might be at a higher risk for tooth decay than you think. Find out what the sugar guidelines are for each age group, what sugar does to your teeth and how you can prevent cavities for both you and your children! How Does Sugar Affect You? Sugar can be so sweet, but not when it comes to your teeth or your body. Did you know that sugar does not actually have any nutritional value? It is an added substance that is found in too many foods to name. It’s even found in baby food, meaning even a small baby may be getting too much sugar in their diet. Sugar has damaging effects to children and adults alike. It not only leads to cavities (more about that later), but it can lead to obesity and weight gain, and inability to lose weight, and can increase your risk for diabetes and other chronic diseases. Sugar can be addicting, and the more you eat, the more you crave. Many people will eat a meal and want to end each meal with something sweet. This is because sugar causes a release of dopamine in your system, which leads to a “feel-good” emotion that people crave. However, sugar also leads to an energy crash, generally within a half hour. Before you think about putting that sugary treat in your mouth, think about how it will affect your teeth and your oral health. 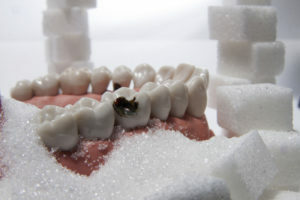 Did you know that sugar is one of the worst substances for your teeth? Your tooth enamel and sugar does not mix well. In fact, sugar actually attacks your teeth in a way. Sugar is found in most foods and drinks that people consume. When you eat, that sugar dissolves and mixes with bacteria in your mouth. That mixture forms a sticky, transparent substance that sticks to your teeth like glue. We like to called this substance plaque, and you might even have some on your teeth right now if you look closely. The more sugar you eat, the more plaque your mouth will make. Even though plaque is clear, it is acidic in nature. When it coats your teeth, it starts to erode away your tooth enamel. 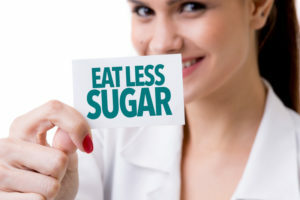 That’s why sugar is such a concern when it comes to your oral health, and why dentists are always recommending patients to limit their sugar intake. More sugar means more plaque, which means more cavities for you. If you start to cut out sugar from your diet, or your child’s you may notice that your child will start to have fewer minor health problems and fewer cavities. 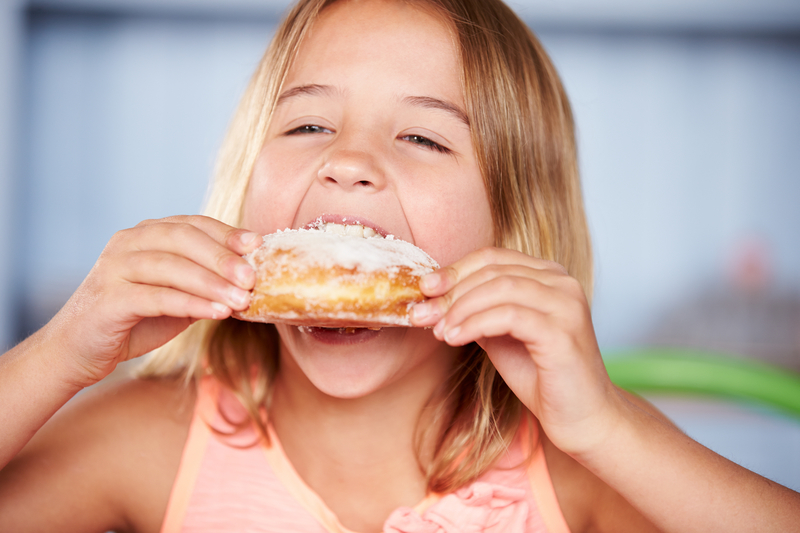 If children and adults alike limit the sugar they consume while they have braces, they are much less likely to have eroded or decayed teeth when they get their braces off. Plaque already sticks to the teeth like crazy without braces. With them, it sticks even more and gets into the brackets as well. Did you know that there are sugar guidelines for how much sugar you should eat in a day? Those sugar guidelines don’t only come from a dentist, but countless health institutions. The National Institute of Health and the American Heart Association report that too many people are over-exceeding their daily sugar recommendation by more than double! Men should only be having up to 9 teaspoons of sugar a day, which is about 36 total grams of sugar or 150 calories. Women should only have up to 6 teaspoons, or 25 grams or 100 calories. Children should have little to no sugar and should consume well below 6 grams of added sugars a day. However, studies show that many people over 18 are consuming an average of 34 grams of sugar a day. Children over 6 are getting 20 grams or more of added sugar a day and even babies 1-3 years old are getting 12 grams or more. It’s no wonder that the NIH reports that tooth decay (known as “cavities”) is the most chronic prevalent disease among children and adults! You want to be incredibly vigilant with taking care of your oral health, especially with braces. Brush and floss your teeth several times a day. We recommend brushing your teeth after every single meal to get rid of acidic plaque and food particles that get stuck so easily in brackets. Don’t forget to floss your teeth. Use floss threaders to make this part of cleaning your braces easier. Cleaning your teeth only takes a few minutes a day (even with braces) and it’s never something you want to skip. You’re spending 18-24 months straightening your teeth. You don’t want that beautiful smile to be full of areas of tooth decay and tooth erosion when your braces come off. If you want a beautiful smile, follow the recommended sugar guidelines for your age group. Brush and floss your teeth meticulously and take care of your oral health. If you need help making cleaning your braces easier, call our Belmar Orthodontics office anytime at (303) 225-9016!